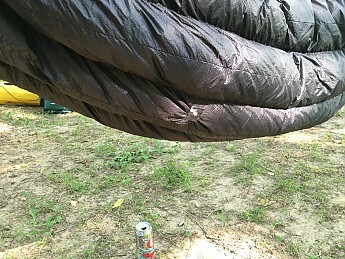 Lightweight for its warmth, this is the cornerstone of my hammock insulation system. 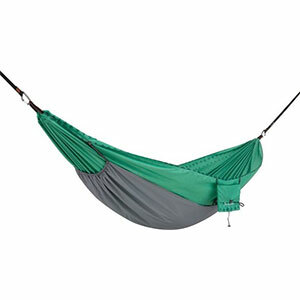 The Hammock Gear Incubator 20 is my primary hammock insulation. I've had mine a year. 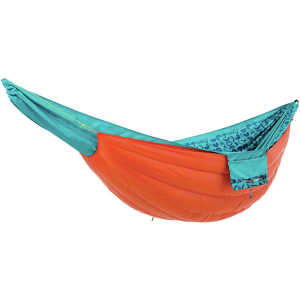 It's been out over 40 nights, car camping, overnight backpacking, and several 2-5 night backpacking trips. It's seen temps from the 80s to the single digits, in all kinds of conditions here in the Midwest. Compared to other down under quilts from similar sized cottage manufacturers, it runs a little lighter for fill weight, is about the same price for size and warmth rating, and quality is similar. I've experienced minimal down loss from this quilt with the occasional feather poking its way out. 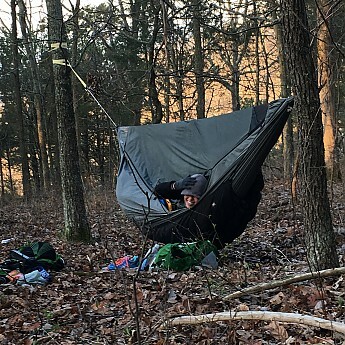 My main top quilt/sleeping bag is a Hammock Gear 20 Degree Burrow, which also has had very minimal down loss and only one loose thread on a seam after a year of use. Here the Incubator is snugged up to a Hennessy for a chilly fall evening. 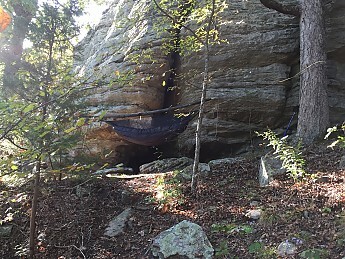 The Dream Hammock above is an 11 footer, my HG UQ is standard length and width, and it's large enough to easily cover my 5'9" frame on the asymmetric lay. The outer materials are thin, but this is necessary to achieve 22 ounces. All in all the Incubator 20 is a solid value. The 20 degree temp rating is a little low I think, but other companies claim similar ratings based on the same amount of down fill and loft. If you think you will spend a good amount of time at or below freezing, I would recommend going with a 0 degree quilt, with overstuffing! Nice review, Andy! Thanks for sharing it. 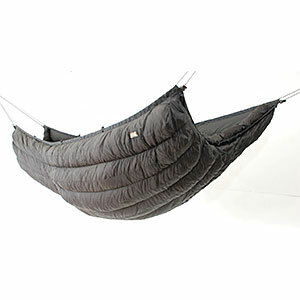 This is a solid hammock underquilt for pretty much any weather situation I find myself in here in the Pacific NW. I've used it winter camping, as well as through the spring and summer. I got this during Hammock Gear's annual Cyber Monday sale last fall for a significant savings off the normal price. And then I waited...and waited some more, which was completely understandable considering the huge number of orders I am sure they received. A month later, I received my quilt in the mail and made plans to get out with some friends on a snow camping trip on Mt. Hood. We snowshoed into a campsite and spent one night in the snow where it probably got down to the low 30s, with small bits of snow coming down too. I used my Mountain Hardwear UltraLamina 15F sleeping bag as a top quilt and between the two quilts I was snug as a bug in a rug and toasty warm too. 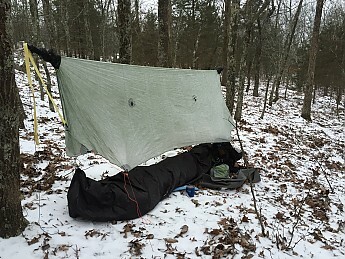 I have since used this under quilt with an Enlighted Equipment RevolutionX 20F top quilt from winter to summer all over Oregon, Washington, and Montana in various weather conditions and usually at elevations above 3,000 ft with no issues. I have stayed warm, never had CBS and have enjoyed this product immensely. It fits easily in an 8L Sea to Summit dry sack, but I usually just cram it into the bottom of my backpack in the pack liner. Hey, Pilgrim, can you add a link to the review. Also, do you have any specs on weight. FINALLY, do they do a Cyber Monday clearance every year? As far as I know they do a Cyber Monday sale every year. The best place to know the sales is on the Hammock Forums. They won't allow an external link...sorry! Praise hail the hammock forums! Lots of good advice and peeps to help with any question. I'm currently waiting on my incubator 20 as we speak. Light. Warm. Excellent quality. Includes stuff sack and cotton storage bag. Built to order options for colors, materials, and over-stuff. Great customer service. I purchased an Incubator 20 short with 1 oz of overstuff, so it is probably more in the 15 degree range as far as rating goes. I have used this quilt down (with a 20 degree HG under quilt with 1oz. overstuff) to a damp 10 degrees and been comfortable (YMMV I am a warm sleeper). The quilt is light enough that it is my go-to for most of the year. If I'm too warm I can adjust the suspension and vent a little. It's long enough to cover me head to toe with length to spare. The width is such that it covers my shoulders very well. Since the quilts are built to order lead times can vary. The guys at HG hit their estimate right in the money (it was two weeks when I ordered). They include a nylon stuff sack and cotton storage bag with the quilt. I wish I would have pulled the trigger on this item years ago. Price always kept me away; but now I see the value. Good review Mac Cherokee. I agree, pricey but well worth it. Mine didn't come with a cotton storage bag, though! Thanks for the review, Mac! I own 13 quilts. 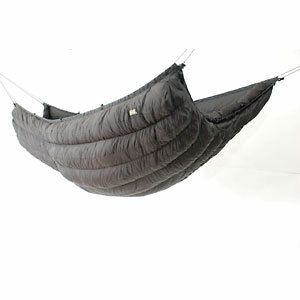 Hammockgear.com has the best design and manufacture of them all. They have the best price-to-value ratio and the best service I've found. Period. 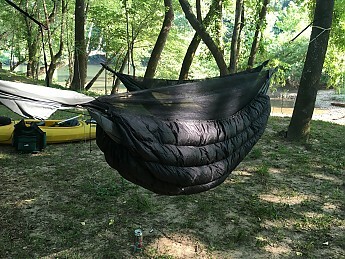 Highly compressible down filled three-quarter underquilt made me comfortable in my Hennessy Hammock in cool weather. Down filled - Keep it dry! 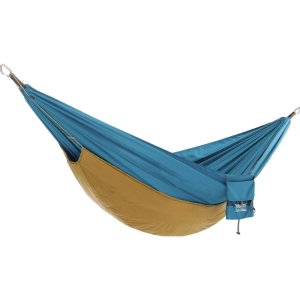 The Hammock Gear Incubator 20° is not available from the stores we monitor.